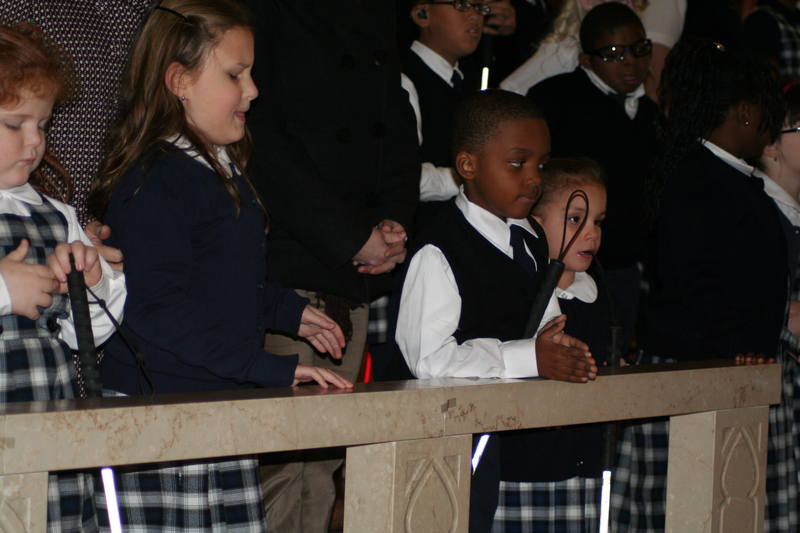 Students at St. Lucy School for Children with Visual Impairments participate in the Dec. 13 St. Lucy Feast Day Mass at Holy Innocents Church. Just as Father Tom Higgins started his homily for the Dec. 13 St. Lucy Feast Day Mass at Holy Innocents Church in the Juniata section of Philadelphia, the lights went out, except for the liturgical candles. It was intentional. Holy Innocents is the present-day location of St. Lucy School for Children with Visual Impairments as well as Archbishop Ryan Academy for the Deaf. The extinguishing of the lights was symbolic of St. Lucy School’s motto, “We Walk by Faith … Not by Sight” from 2 Corinthians. “Jesus is the light of the world, we walk with Jesus in the light,” Father Higgins told the students and parents of the two schools for special education as well as the children at Holy Innocents parish school. St. Lucy’s, named for the martyred patron saint of those suffering from eye diseases, was founded 61 years ago by the late Bishop John J. Graham, when he was superintendent of the archdiocesan schools and now has 32 children in its program. Archbishop Ryan, which will celebrate its centennial next year, now has eight children under instruction. That lesson is not lost on Simon Bonenfont, of St. Dorothy Parish in Drexel Hill, even though he is only in the third grade. Because disabilities are often genetic in nature, in some instances the two schools are a family tradition. After the St. Lucy Mass, which is an annual tradition, the festivities continued in the school where the children treated their families and benefactors to a musical concert and refreshments. The blessings are mine!! Thanks Pat! We miss you! Sister Meg Fleming is an inspiration to us all. Her compassion for her students in evident on a daily basis. The children of St. Lucy’s and Archbishop Ryan are lucky to have her in their lives.